Flying ants and termites are easy to identify once you know what to look for. 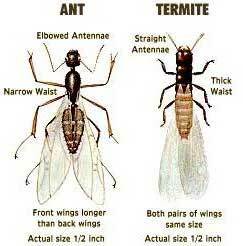 The easiest way to determine if a winged ant is a termite or not is by looking at the length of wings. Termite has equal length wings, but flying ants have wings that are different in length and width. Another way to tell the difference between flying ants and termites is by looking at the shape of their body, especially abdomen. Termites have straight abdomen (thick waist), like a shape of rice. But flying ants have a very narrow waist, just like the ants that you see on the ground. Lastly, flying ants have bent antennae, but termites have straight antennae. Just yesterday, I found a swarm of ants and ants with wings. Immediately, I wasn’t sure if they were termites or just flying ants. I couldn’t tell by looking at the shape of the wings because they weren’t flying, but I was able to tell the difference when I looked at their abdomen. If you identify a winged termite near your house, rather than go DIY termite control, it is best to call a termite control professional.